The FDX Front-Wheel Drive Power Wheelchair features core technologies such as the Single Stage Drive (SSD) motor-gearbox combination, Invacare MK6i Electronics and Invacare G-Trac true-tracking technology. The FDX with Formula CG Powered Seating is available in Tilt/Recline and Tilt/Recline/Elevate. 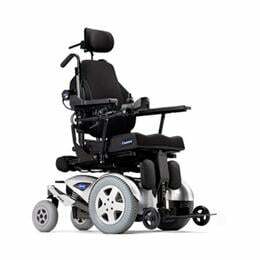 For superior performance both indoors and out, the FDX Wheelchair is the answer.